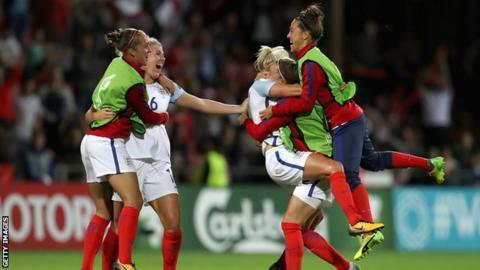 England players celebrate reaching the Euro 2017 semi-finals after beating France for the first time in 43 yearsThe Football Association has submitted a bid to host the Women's European Championship in 2021.England hosted Euro 2005 and reached the 1984 and 2009 European finals.FA head of women's football Baroness Campbell told BBC Sport: "It would be enormous to have a major championship like this on home soil. "Uefa will want a bigger and better tournament than the last one and we've got Wembley as a key card to play, to host the final. "A final decision on the successful host nation will taken by Uefa on 3 December 2018, with Austria and Hungary also believed to be in contention. The FA's decision to submit its bid, which has the backing of the government, follows England successful Euro 2017 campaign in the Netherlands which saw the Lionesses reach the semi-finals, generating a record peak audience of four million TV viewers in the UK.The proposed cities and stadiums included in the bid are Brighton & Hove Albion's Amex Stadium, Brentford's Community Stadium, MK Dons' Stadium MK, Manchester City's Academy Stadium, Notts County's Meadow Lane, Peterborough's Abax Stadium, Rotherham's New York Stadium and Sheffield United's Bramall Lane. Chelsea Ladies' won the 2018 FA Cup final in front of a record crowd of 45,423 at Wembley. What is the state of women's football in England[/IMG]"We have invested heavily in the women's game in recent years and the opportunity to bring the tournament to England would represent a landmark moment for women's football in this country. "Our aim is to make Euro 2021 the biggest and best showcase for women's football ever seen in Europe. "We have not only the ambition, but the tournament hosting experience, infrastructure and incredible spectator demand to ensure we would deliver a truly memorable tournament."